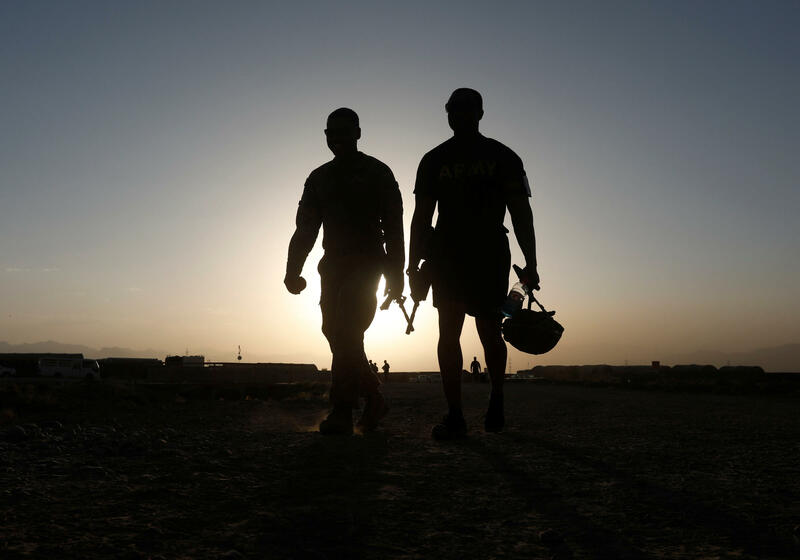 U.S troops walk at their base in Logar province, Afghanistan August 4, 2018. The U.S.-led NATO Resolute Support mission in the country had earlier announced the death of two service members said in a brief statement Friday. Their names were originally withheld in order to first notify family members. The Taliban insists on a complete U.S. withdrawal, but representatives of the Afghan government want some continued U.S. presence. Ahmad Nader Nadery, who has advised Afghan President Ashraf Ghani, told NPR that the government would like a "residual number" of U.S. forces present for counterterrorism operations, training and advice.